USUALLY the circumnavigation of Ireland by sea is done with some creature comforts. LANDING: Gary Sargent lands his 13 foot Laser dinghy in Mullaghmore on Monday evening. For a start, there would be a facility aboard the yacht (usually) to have a cup of tea, to lie down or just simply to stop sailing at some stage or other during the journey. This is not the case for Gary Sargent, who is sailing around Ireland in a 13 foot Laser dinghy. Normally the Laser is a boat reserved for short distance sailing such as races around a course and not huge offshore distances. Gary, however, is well into the 1,500km marathon sail and took a well deserved break this week along the way in Mullaghmore. He explained what made him want to undertake this mammoth challenge. “It started off as a joke to sail the dinghy around, but I slept on it for a few weeks and thought ‘yeah I might give this a lash’ and that is how it started. That was 2015 and that is why I am here after just sailing into Sligo,” Gary said on Monday. Gary has previously sailed around Ireland in the annual Round Ireland Yacht race, but decided to undertake a different challenge to raise money for ChildVision, a charity who helps visually impaired children in Ireland. “I had done the comfortable yacht thing. It felt hard at the time but it seems a whole lot easier now! I think this [sailing around in a dinghy] gives you massive respect for the water. We don’t leave without checking forecasts or tides, but that doesn’t matter. It is still so variable and unpredictable,” he said. 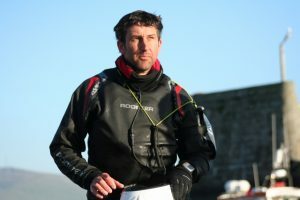 To make his way to Mullaghmore on Monday, Gary sailed just over 38 nautical miles. He made his way from Ballycastle to Mullaghmore, and although it is a significant distance in the boat, Gary has managed 40 plus miles in a day. The result, despite less mileage is no less tiring. “Today was a mix. At one stage I was sailing into the wind and at times with the swell it is like getting punched in the ribs and then after that you fight with the boat to keep it up. It is physical, but mentally too, I am exhausted,” Gary said. The choice of charity is something which helps to keep Gary going. “I wanted to do it for this charity which maybe does not have national exposure. On one level the personal achievement is everything, but I think it would be wrong not to use it as a platform to raise money for a good cause. I am blown away by the work ChildVision do. They are the only educational centre for blind and visually impaired kids,” Gary commented. Gary’s journey is being recorded on the live blog site ‘One Wild Ride’. There is also an option to donate on the page directly to ChildVision charity.